Look out for otter and dippers in the rivers, black throated diver on Loch Shiel and red deer and raptors, including golden eagle, on the hills and crags. The route is way marked by wooden posts but the path can be a little indistinct in places, particularly near the start. 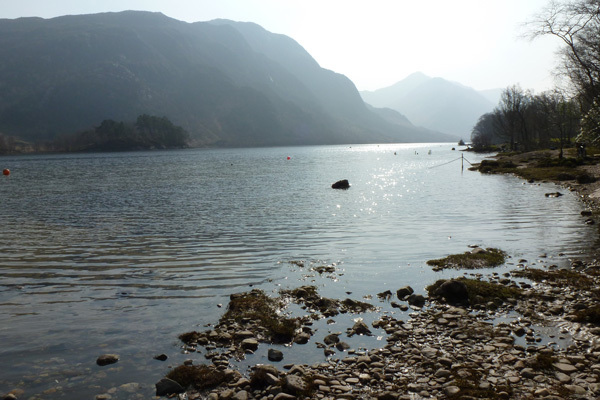 This walk is best done in fine weather after a dry spell, and should only been done by an experienced hill walker in less favourable conditions. 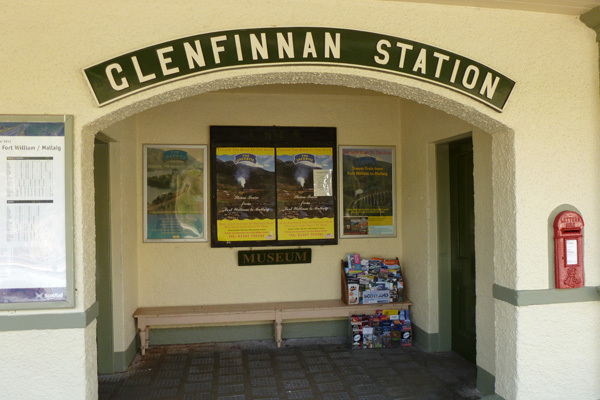 Attractions nearby include the Glenfinnan monument and Nation Trust Visitor Centre, and the Railway Museum at Glenfinnan station and St Mary & St Finnans Catholic Church. 1. Park at the car park opposite the road to The Glenfinnan House hotel, just north-west of the National Trust Visitor’s Centre car-park. 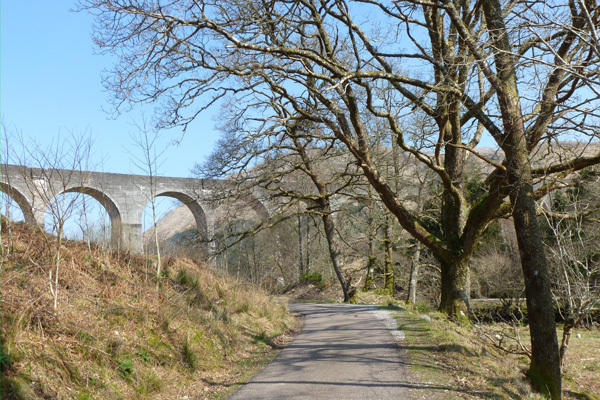 Take the tarmac track to Corryhully by the banks of the River Finnan heading towards the viaduct. Listen out for woodland birds in mixed deciduous woodland of birch, alder and willow fringing the river banks. There are also some fine oaks and mature Scots pines. 2. At the wooden bridge crossing the river, take the path on the left side of the track, marked by a wooden post, which passes in front of the viaduct. The path ascends steeply uphill affording good views of the viaduct on the right, before passing under the viaduct at the far end, and then through a gate. This path is very muddy in places and can be rather indistinct at times. Once through the gate, the path passes up hill just to a wooden way-marker post and then heads left up hill soon becoming parallel with and in sight of the railway line. The path is rather indistinct here but becomes more obvious as you head up the hillside. The path passes through wet heath and bog, eventually crossing a small stream. 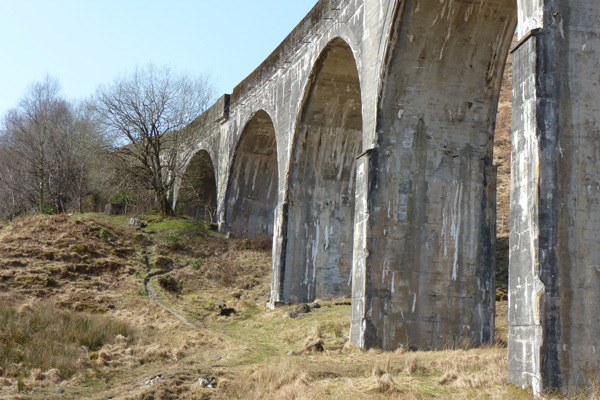 Turn back for good views of the viaduct and look out for the Harry Potter Express. 3. The path eventually reaches the fence line and continues along it for a short distance. Continue on the path following the wooden way-marker posts ahead traversing the hillside. The path is fairly distinct at this point and the route passes mainly through heath dotted with small conifers, with bog asphodel (Narthecium ossifragum) and bog myrtle (Myrica gale) in the wetter areas, as well as patches of bilberry (Vaccimium myrtillus) and bracken (Pteridium aquilinum) in the drier areas. 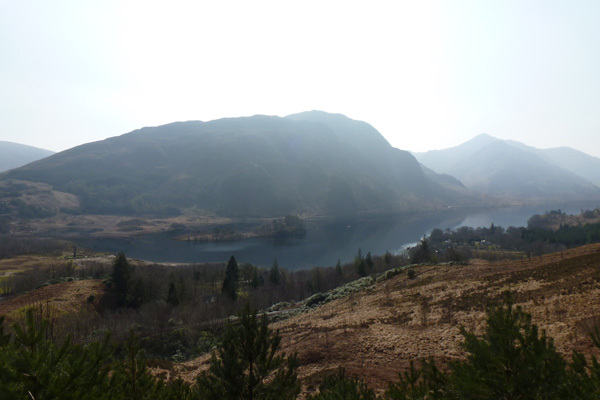 There are some great views of the Glenfinnan monument, Loch Shiel and the surrounding hills and crags. Look out for golden eagles on the surrounding crags. 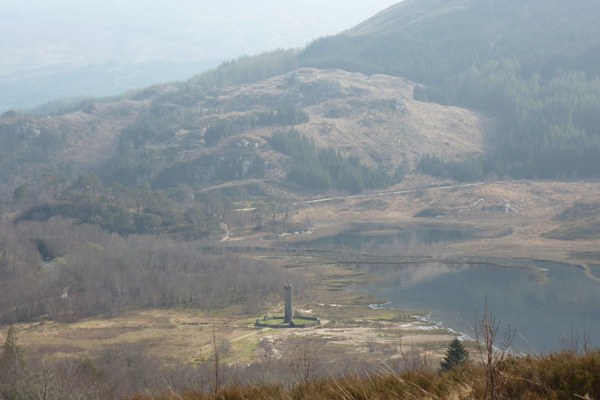 There is a lovely place for a picnic by one of the way marker posts at a grassy hummoch that affords good views over Loch Shiel. 4. 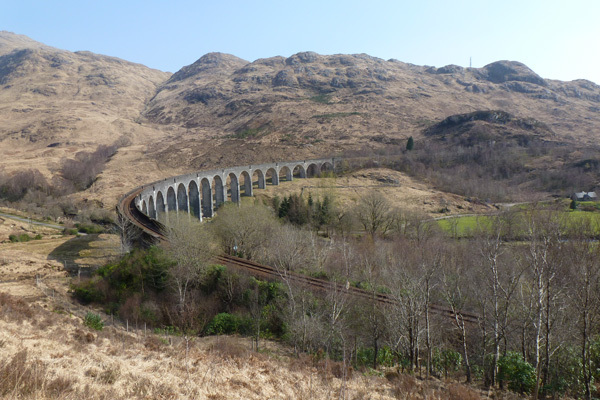 The path eventually crosses an exposed rocky outcrop and then descends towards Glenfinnan station, passing through a small pedestrian tunnel under the railway and then over a small bridge over a stream. The walk then passes through a lovely wooded area with some board walk sections made from railway sleepers. The wood contains some fine exotic specimen conifers, including Monkey puzzle tree (Araucaria araucana), as well as some ancient beech trees (Fagus sylvatica). 5. Continue through the woodland on the boardwalk, ignoring the path of the left. Head up towards the stationary railway carriages in the station (one currently serving as a tearoom and another as a bunkhouse) (seasonal opening). At the station, you can also visit the small Railway Museum. 6. 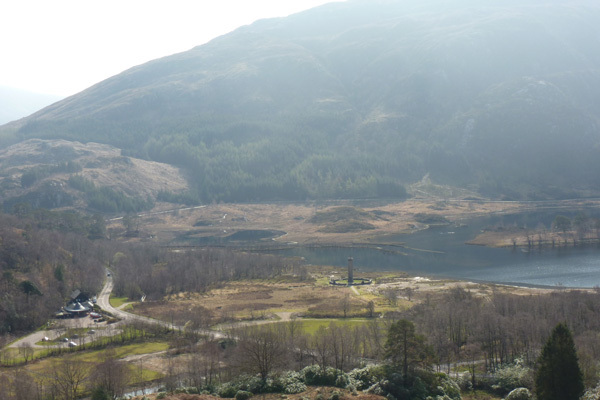 On leaving Glenfinnan station, head towards the A861 and turn right. Soon after, take the first left down a track by some houses, signposted to the pier. 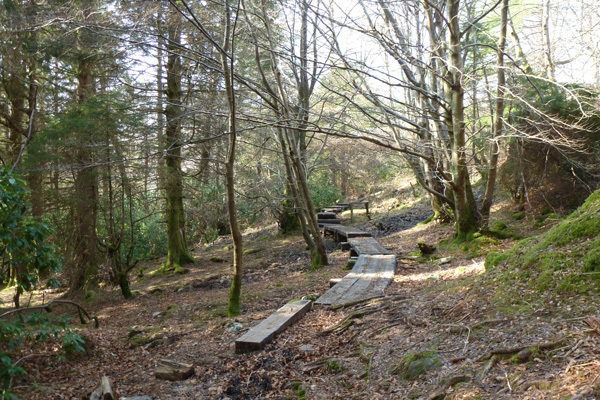 The track descends and crosses a small stream and then runs parallel to the river Abhainn Shlatach. The river is fringed by mixed deciduous woodland. There are also some fine specimen trees on the left hand side of the track, including cypresses. 7. When you meet the tarmac road turn left at the T-junction and continue along the road by the shores of Loch Shiel passing the Glenfinnan House Hotel on the right and St Mary & St Finnans Church in an elevated position on the left hand side. The Gothic style church was designed by E. Welby Pugin, and consecrated in 1873. 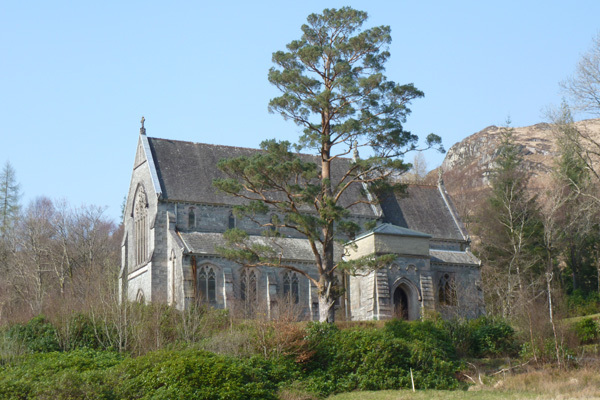 It served as a memorial chapel to the MacDonalds of Glenaladale (involved in 1745 Jacobite uprising) and contains memorial stones to the family and Bonnie Prince Charlie. There is a large bell on the far side of the church. The church is best explored from the A861 on your return. 8. At the end of the road, cross the A861 and return to car park.